Chronic Pain Part 1-Why the pain is always in your brain. Pain; whether it is an acute tissue injury or chronic persistent pain, it is processed in the brain. It feels to us that the pain is in the body tissues. Pain fibres are stimulated in the body when it is injured but the actual processing of pain occurs in the brain. In acute tissue injury, for instance, if you sprain your ankle, the pain fibres will fire to the brain and this warns us to adjust the activity we are doing to prevent further injury. In this case we also have chemical changes, such as inflammation, to enhance the tissue repair. In CHRONIC PAIN the situation is different: Chronic pain is pain that has been present for more than 3 months. It is pain that remains when all medical causes have been ruled out. Pain that is present beyond the time that any injured tissues have healed and is probably not be related to any tissue injury at all. The 'but all I did was get something out of the cupboard pain'. There wasn't pain all the previous times you got something out of the same cupboard but this time the brain is registering pain. The 'but the pain keeps moving' pain, the 'but my pain doesn't seem to respond to anything and I've had it for months or even years'. If it is hurting it is injured, isn't it....well, not always. This can be REALLY hard for us to get our heads around, I want to re-iterate, at this point, that chronic pain is still REAL PAIN and the pain can be as excruciating as having a prolapsed disc or sciatica or a sprained ankle or planter faciitis or all these things at once but how we need to address it is different. Chronic pain is often the body's way of telling us that our brain and central nervous system is feeling overwhelmed. This can be due to current stress or previous stress or trauma, relating to events as far back as childhood. There is now extensive research into how our bodies respond and produce pain, real pain, and how we need to address it. 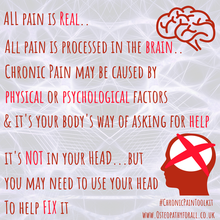 As a chronic pain sufferer I understand how difficult it is to get people to understand how it is, I also understand that when people sound like they are suggesting it is all in your head, it is intensely frustrating and infuriating. However, to effectively treat chronic pain we need to understand that we have to look at the body's whole story, everything that has happened to it physically and emotionally through it's whole existence.